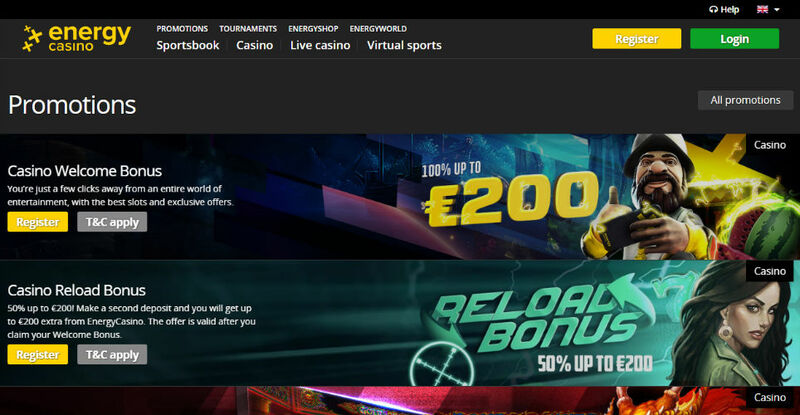 In March 2013 registered in Malta, Energy Casino exploded onto online gambling market to compete with modern gaming houses of the highest European standards. The casino looks ahead, so download client is not provided. Choose instant online play among a truly wide range of casino money games from NetEnt, Microgaming, and Greentube. Note that an access to play favorite Novomatic slots is closed for players from Germany, Austria and Switzerland. For the others, the excellent Novoline collection of slots including series of legendary Book of Ra is available to play free along with bestsellers by NetEnt and Microgaming giants. With a proliferation of mobile devices, Energy Casino Mobile client was put into operation. Over than 80 casino games are available online on Android & iPhone. 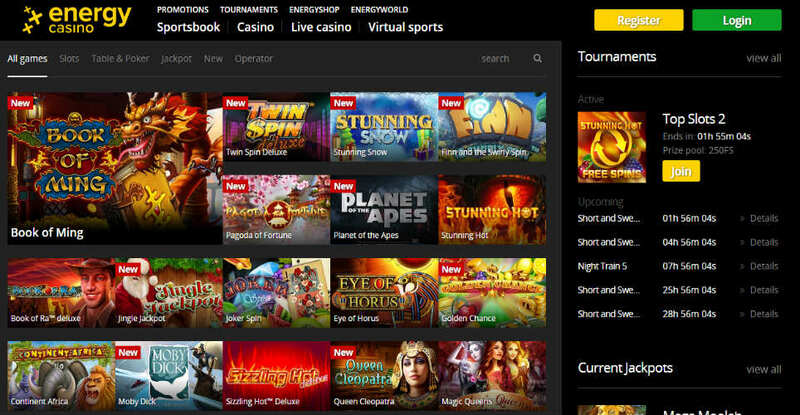 Recently Energy Casino had no Live games, but today there is Live Casino section with super hot dealers that feature a real casino atmosphere when you play Roulette, Blackjack or the game of the highest stakes - Baccarat online for money. Currently, the casino attracts new customers with exclusive Bonus Promotions applied to 300+ slots & other casino entertainments. And in сase of the casino players have any questions, there is a round-the-clock live chat with competent operators. There is one wondering thing for winners – in case of a player won €2,500 and more, Energy Casino can ask the rights to use the player’s details like Nickname and picture to promote itself in media or internet sites. Do not miss an opportunity to ask in exchange for extra Free Spins or additional no deposit bonuses. Get 100% Welcome Bonus up to €200 with a minimum deposit of € 10. Double your chances - multiply cash to play real money slots of the best games providers in the world. One more sugar point – get 500 virtual credits and learn some more Energy Casino Games online for free, decide which games are worth to play for real money. Follow promotion requirements that depend on the location. UK players must wager 30 times deposit and bonus amount. Australian, Canadian, Croatian, Greek, Portugal, and Serbian players have to wager Welcome Bonus 40 times. For the rest countries, playthrough is x25. Sing up Bonus doesn’t cover such Energy Casino games like Baccarat, Blackjack, Wild, Joker Wild, Jacks or Better, Video Poker games, Multiball Roulette, European Roulette, Sick Bo. For the second deposit, Casino Energy gives 50% up to €150. 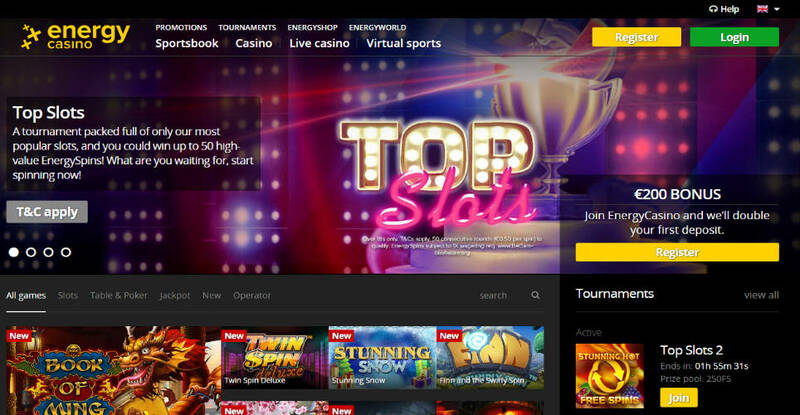 On top of all, Energy Casino holds weekly tournaments with different slot machines involved. Monthly leaders of the rush get different gadgets such as iPad or a lighter as nice prize, as well as extra Free Spins to try new slots online free before cash wagering. Be aware that residents from not all countries can claim for the bonuses in Energy online casino. Read details in bonus terms and conditions before attempts to get free money. To carry out withdrawals, with the first request, be ready to verify your identity, address and bank receipt for paystics users. As it stated by the casino, the entire verification procedure along with the money withdrawals takes 2-3 days. However, with our experience it truly takes much less, sometimes even within 15 minutes. Note that you can use this payment system only the deposit is placed through. Keep in mind that only the first withdrawal of winnings a week is fee free, and the next payouts the week means for you minus €10 from your monies. It is rumored that some tech malfunctions happen while gaming from time to time. We know that in such events the casino management compensates for an inconvenience. IMS recommends Energy Casino online for real money play and wishes you big winnings!